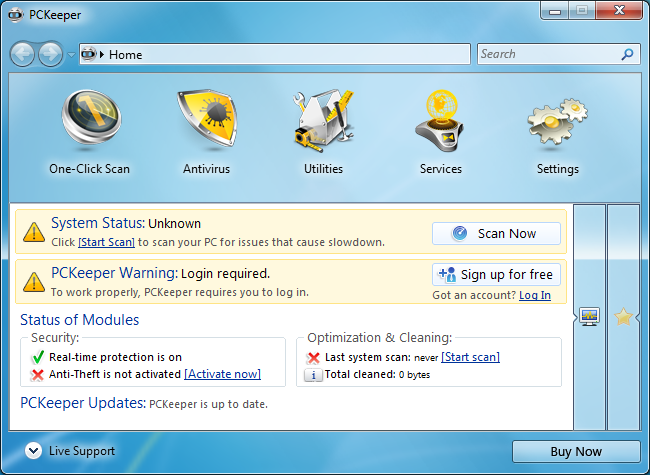 PCKeeper is a comprehensive suite that comes packed with security, privacy and PC maintenance tools. So it includes an antivirus package, for instance, that protects you all kinds of malware, as well as phishing attacks, dangerous email attachments and other threats. And if you launch this via PCKeeper's one-click scan tool, then not only will it detect and remove malware, but the program will also check for disk errors, wipe leftover files and defragment your hard drive at the same time. A collection of individual utilities then allow you to control your Windows startup programs; completely uninstall applications; recover accidentally deleted files and folders; and hide confidential information from prying eyes. And a handy anti-theft service could be very useful. If your laptop is stolen, then when it next goes online, PCKeeper will immediately report on its location, and even attempt to take a webcam shot of the thief, updating this every five minutes. Please note that the price we're quoting here is for one year and one PC. There are 3 or 5-PC licences available at additional cost, however if you buy a two year licence then you can also save money. Check the Buy link for more information.